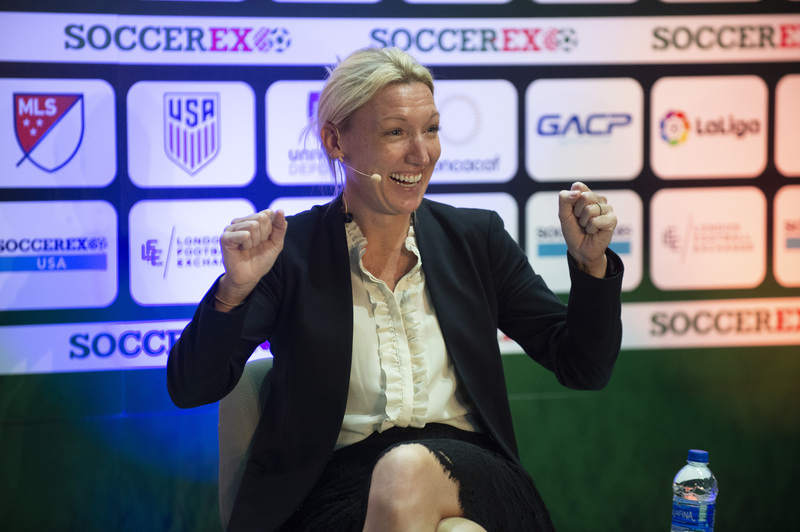 For the first in our new series of interviews with our expert advisory board we sat down with Amanda Vandervort, a football player, coach and sports business executive with more than 20 years’ experience. Here, she tells us about her role with AFDP Global, her belief in the power of sport to achieve change, and her hopes for the future. Q1. It’s great to have you on the AFDP Global advisory board. Why did you decide to join? What is it about the organisation’s mission and vision that resonates with you? Thanks, it’s an honor to be a part of such an incredible organization! When HRH Prince Ali shared his vision for what AFDP Global would become, I could see the opportunity so clearly, and most importantly, I knew he was doing it for all the right reasons. I immediately saw how my values, passions and ambitions were aligned with the organization and I was so excited to play even a small role in its success. The opportunity to transform communities through soccer is something I’m incredibly inspired by. I see a future where soccer inspires women and girls to pursue their dreams, develops men and boys beyond the boundaries of the pitch, and instills values like respect, accountability, and confidence in people of all different ages and backgrounds. I see a world where kids smile because they have a ball at their feet, and adults are united by the promise that the next touch holds. I believe AFDP Global will play a huge role in making these things a reality and I’m humbled by the opportunity to be part of it. Q2. What are you hoping to bring to the table as part of the AFDP Global advisory board? Prince Ali has assembled an incredible group of advisors, board members and staff who each bring something unique and special to AFDP Global. For my part, I’ll draw on my experiences as both a soccer player and a coach to help connect us to the game inside the white lines. I’ve played since I was a young girl, and coached players of all ages, from youth to adult, girls, boys, men and women, coaching competitive teams and recreational ones; goalkeepers and field players alike. I’ll also leverage my background in professional soccer to offer insight and expertise on the business side. I’ve been part of the rapid growth of both men’s and women’s professional soccer leagues in the United States, with a focus on using social and digital media to increase awareness and engagement. So I’ll be able to add a touch of marketing and management expertise to help ensure sustainability. Finally, I’ll bring sunshine. It’s important that everybody who touches AFDP Global has a positive experience – from the advisory board and staff, to donors, partners, volunteers, participants and program applicants. Together, we’ll accomplish incredible things… and have a great time doing it! Q3. You clearly have a strong belief in girl’s and women’s football and how it can change lives – can you tell us a bit about what has shaped this passion? Any particular experiences that stick in the mind? I grew up the daughter of a single working mother in Tucson, Arizona, and experienced the reality of soccer’s rising income inequalities in the United States as my family struggled to pay for the camps, travel and equipment necessary to play. Mine was a dusty desert town with little access to sports, and I recall my divorced parents arguing about fees and time constraints. But I loved the game and the friendships it gave me, so I knocked on doors for donations to cover registration costs and gas money, and scratched enough money together to keep pursuing my dream of a college education through a soccer scholarship. My passion for girls’ and women’s soccer stems from this experience. Soccer became both my escape and my salvation, and it taught me focus, discipline and drive. And it established my core belief that soccer can light a path to women’s empowerment, specifically equal opportunities for females to play, work and volunteer in both the men’s and women’s game. And that soccer can lead the way in equal pay and resourcing up and down all levels of the game. Today, as a female executive in the men’s professional game, it’s a privilege to be able to give back to the game that’s given me so much, and am honored to have the opportunity to do so. I share AFDP Global’s core believe that the power of soccer is for everyone. By empowering our players, both girls and boys, and our supporters, partners and donors, we’ll give them the skills, resources, opportunity and motivation to do what they aspire to. Q4. Can you tell us a bit about how you first became involved in the world of soccer? I’ve described a bit about the beginning of my soccer journey above, so let me tell you about why I stay in the game. About fifteen years ago, I was coaching three teams in the urban jungle of New York City – a women’s college team, a girls’ youth team, and a men’s recreational team. They were all struggling to win, and one day after a crushing defeat of my men’s team, I just broke down and cried. I thought I was a failure as a coach. I was wallowing in doubt and self-pity until one of my players came over and consoled me, and in doing so he changed my life forever. He said that wins and losses didn’t matter. But instead, the community we had brought together through soccer had literally saved his life. He revealed he was HIV positive, a recovering alcoholic, and had a broken relationship with his family since he came out as gay as a teenager. He said this soccer team had become his family, practices kept him healthy, and games kept him sane. Without the fitness, focus and support he received with this team, he could have easily descended into an abyss of drinking, drugs and perhaps even worse. In that moment, I took a deep breath, and realized the greater impact of our beautiful game. Since that day, it’s been the power of soccer to positively impact lives that compels me to stay involved. Q5. Now that AFDP Global has launched, what are your hopes and ambitions for its future? First and foremost, I’d like to help AFDP Global to fulfill Prince Ali’s vision for transforming communities through soccer. When he describes the impact he’s seen our sport have in some of the most challenged places around the world, it fills me with hope and pride for what we can all accomplish together through this organization. Also, I really admire the inclusive approach of our CEO JF Cecillon, and expect that we’ll maintain an ethical independence in our decisions, but embrace a spirit of collaboration and partnership in our work. Personally, my hopes and ambitions are simple: That we’ve created long-term, sustainable programs that positively impact people’s lives through soccer.